Blend the dressing in a high speed blender (like Vitamix) until creamy. Toss and gently combine the kale with dressing and the hemp seeds. Massage gently to evenly coat the kale. Arrange in a single layer on dehydrator trays and dehydrate at 105 F until crispy. 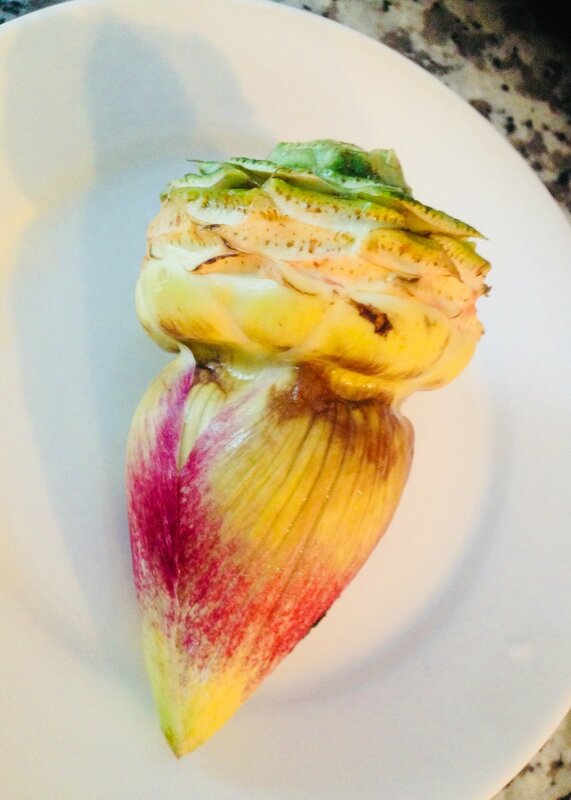 Here is a unique recipe using artichokes, one of the world’s healthiest foods. Artichokes offer a bounty of flavor and nutrition, detoxify the body and improve liver health. The best part is that you can eat the artichokes raw in this marvelous and delicious recipe. Most other recipes are for cooked, frozen or artichokes marinated in citric acid or other preservatives. Why not allow your body to absorb each and every nutrient in its best raw natural form? Use a sharp knife, to carefully remove the thorns and discard the inedible choke. Slice the artichoke heart very thin (a vegetable peeler is very helpful for making thin slices). Add the rest of the ingredients, toss well and enjoy fresh at room temperature. A fresh and flavorful raw cauliflower dish that can be a great side dish or by itself. Cauliflower, a member of the cruciferous family, along with fresh and healing herbs, essential oils and powerful shiitake mushrooms furnish a complex combination of health benefits in a single bowl. Chop the cauliflower, parsley and onion in a food processor until the mixture resembles couscous. In a separate bowl mix the olive oil, lemon juice, spices and essential oils. Add everything together including the olives and toss well. Decorate with marinated shiitake mushrooms and enjoy! Blend everything in a high speed blender (like Vitamix) until creamy and smooth. Enjoy with crudités** or raw crackers. Treat your guests and yourself with a special treat for the holidays and boost your immunity with a shot of natural vitamin C from these jewels of nature. This dish is made in less than two minutes and is sure to impress everyone with a surprise combination of juicy sweet and sour orange, crunchy tart Roselle and a touch of pepper-like Nasturtium flower. Roselle (Florida Cranberries, Jamaican Sorrel, Red Sorrel, Java Jute) is a species of hibiscus that grows in tropical climates that is both a treat for the eyes and your taste buds. The bright red cup-like structure contains the plant's seeds and is called a calyx. Calyces are edible and you can peel them easily when ripe to enjoy the crisp, tart and tangy taste. They add a nice tart crunch to this dish. 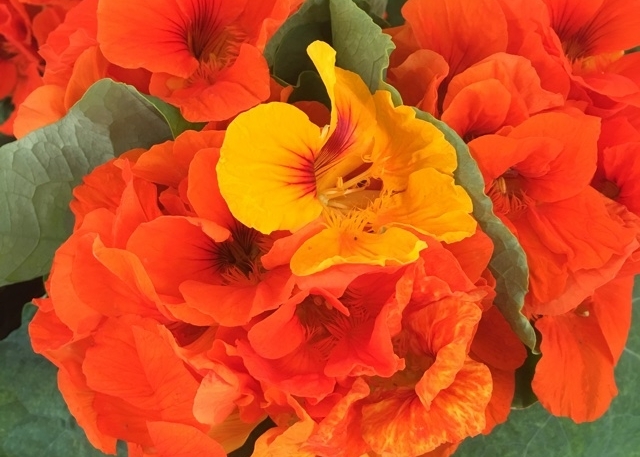 The delicate Nasturtium Flowers are colorful, edible, butterfly-like blossoms that have delighted gardeners and cooks alike for centuries. They are an absolute delight with their subtle pepper like taste and add more vitamin C to this unique bouquet of aromas. Arrange everything as shown in the picture and enjoy fresh at room temperature. Enjoy, be in the moment and appreciate every blessing in your life. Merry Christmas! Try this fast recipe for a delicious slaw with a different spin on homemade pesto. Everything is made in a food processor, saving time for cleaning and preparation also. Using the S-blade of your food processor, shred the carrots, radishes and ginger and then transfer to a serving bowl. Clean out the food processor before adding the avocado, herbs, garlic, lemon, turmeric and salt. Process until the herbs are finely chopped. With the food processor running, slowly drizzle in the olive oil and water to emulsify the pesto. Toss the pesto with the shredded vegetables in the serving bowl and enjoy fresh. The flavors of thyme and nutmeg are a perfect marriage made in heaven. Try this Casserole for the holidays. Place the chopped broccoli in a casserole pan. Blend in a high speed blender (like Vitamix) all of the other ingredients until a nice and creamy sauce is formed. The consistency should resemble that of sour cream so add more milk if too thick. Pour the sauce over the broccoli and serve fresh. One should include fermented vegetables in your daily diet. This easy recipe is very versatile. Top one half of an avocado with it, add it to a salad, eat it with lunch and dinner, use it as an appetizer or a side dish. Just a single tablespoon is packed with many probiotics, vitamins and minerals. Use a food processor to shred the cabbage, carrot and onion. Add sea salt and massage the vegetables for 5 minutes. Taste and add more salt if necessary - it should be a bit on the salty side, but not too salty. Soon you should see some liquid coming out of the vegetables. Stuff a very clean glass jar tight with the vegetables, pushing most of the air out as you fill the jar. Leave 2 inches of free space at the top of the jar for fermentation. Add the rest of the ingredients on top of the vegetables and make sure everything is completely submerged in the liquid. Optionally, add a tiny branch of wood. Cover lightly and leave at room temperature for 5-7 days. Ferment to taste and when complete put the jar in the refrigerator to stop further fermentation. What do you do with the pulp from your green vegetable juice? Especially, if you juice daily, you can accumulate a lot of green juice pulp. Don‘t throw that pulp away and make the most out of your money by trying this easy recipe. Mix well all of the ingredients. Spread the batter out on a dehydrator tray using a spatula or your clean hands to flatten it out as much as possible. Then use a knife to score the batter into cracker size squares. 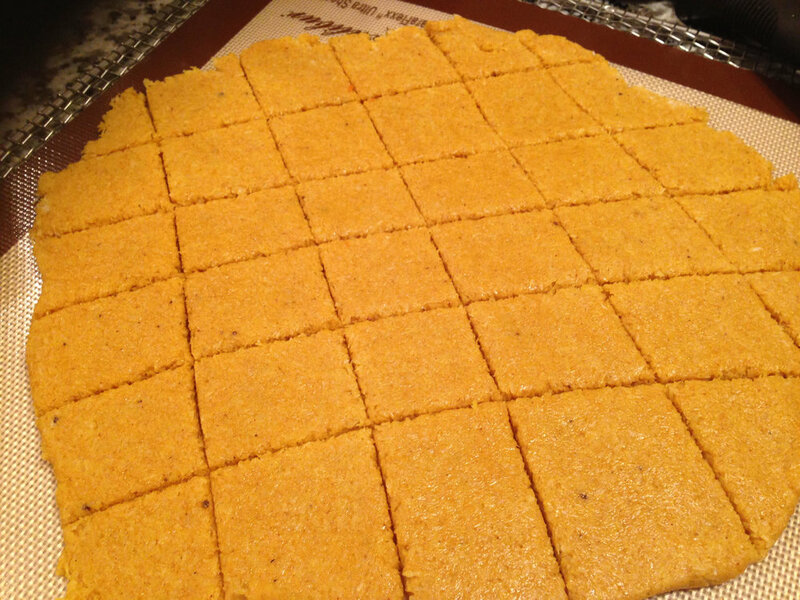 Dehydrate on low and be patient because it may take up to 12 hours to obtain crispy crackers. They are delicious on their own or to dip into your favorite sauce. The gut houses a significant amount of the immune system, so it’s important to keep the gut healthy. One way to do this is by eating foods that contain probiotics - friendly bacteria that help keep your digestive system healthy by controlling growth of harmful bacteria. To help maintain healthy levels of probiotics, feed them with foods rich in prebiotics - indigestable carbohydrates that are food for probiotics. No foods naturally contain both probiotics and prebiotics so it is a good idea to consume both types of foods in most every meal. Use a clean glass jar and stuff it tight with the washed vegetables and the other ingredients except water and salt. In a separate glass bowl, make enough pickling solution to fill the vegetable jar within 2 inches of the top by dissolving the salt into the water at a ratio of 1 liter water to 1 tablespoon salt. Pour the salt water over the vegetables making sure to completely submerge all vegetables while leaving 2 inches of free space in the jar for fermentation. Cover lightly and leave at room temperature for 5 to 7 days, depending on the warmth of the room - fermentation proceeds faster at warmer temperatures. Ferment to taste and when complete put the jar in the refrigerator to prevent any further fermentation. Enjoy knowing that probiotics from these vegetables are boosting your immune system and helping maintain a healthy gut flora. Did you ever think that you can have a delicious healthy falafel that is not deep fried and tastes out of this world? You can, thanks to the secret of spices such as coriander and cumin. There is no need to fry or cook this falafel - the flavor is already there! Use a high speed blender (like Vitamix) to grind the oats into flour. Add the chickpeas and process slowly to obtain a uniform paste. Add the rest of the ingredients and blend well. Add a tablespoon of water if the mixture is too thick. Form the falafel with your hands or with a cookie cutter. Enjoy at room temperature as you would a typical Middle Eastern falafel or drizzle it with a sauce or dip from our nearby sauces & dips recipe menu. * Use a food processor to avoid beet root stains on your hands. ** Sprout the chickpeas by soaking them in water over night. On the second day, drain and rinse a few times and then steam them lightly for few minutes - the sprouted chickpeas don't need a long time to cook. Add all the ingredients in a high speed blender (like Vitamix). Start blending on slow speed and increase the speed as you go. * Add a little water, if needed, to help blend all the ingredients into a smooth pateé consistency. Dip in carrots or celery stalks. Enjoy at room temperature. Will keep up to 5 days in the refrigerator. Rinse the collard leaves and trim off the stems. Thinly slice the red pepper, avocado and cabbage into strips. With the stem side facing you, start filling the collard leaf with the sliced vegetable, sprouts and microgreens. Roll and fold in as you go. For the dipping sauce, blend the mango, tomato, coconut oil, ginger and jalapeno until smooth.